This part is about the theory of noise in transistor amplifiers. k = Boltzmann's constant = 1.38 . 10-23 J/K. T = Temperature of the amplifier in Kelvin (K). R = Resistor value in Ohm. q = Charge of one electron, which is 1.6 . 10-19 Coulomb. Ic = Transistor collector current in A.
Ib = Transistor base current in A. Formula 1: eth(R) = √ (4.k.T.R) V/√Hz. The thermal noise in a resistor is a result of the random movements of electrons, caused by heat. Formula 2: in = √(2.q.Ib) = √(2.q.Ic / hfe) A/√Hz. This is not thermal noise, but shot noise. Shot noise occurs when a current has to cross a barrier, for instance an imperfection in a conductor. In a transistor, the b-e junction is a barrier, which the electrons have to cross. The electrons build up potential energy in front of the barrier, then jump randomly across the barrier, and release the extra energy as a little "pop" in the current flow, which is noise. And so, the more DC current flows, the more shot noise there is. Internal of the transistor, the full collector current flows via the base to the emitter. The base-emitter junction has a dynamic resistance of: Rd= k.T/(q.Ic). When we multiply this by the collector current noise density (√2.q.Ic), we get the voltage shot noise density of the base-emitter junction. Formula 3: esh = k.T.√(2/(q.Ic)) V/√Hz. This noise density is caused by shot noise, the temperature is only present in the formula, because the dynamic resistance of the b-e junction depends on temperature. Both thermal noise and shot noise are spectrally flat, or in other words: it is white noise. In addition to thermal noise and shot noise, at low frequencies also 1/f noise can occur. This causes the voltage noise and current noise to increase at low frequencies, especially below 100 Hz for transistor amplifiers. The 1/f noise will be disregarded in the noise calculations I make. The transistor b-e junction has in accordance with formula 3 a voltage shot noise density of esh = k.T.√(2/(q.Ic)) V/√Hz. This is a theoretical minimum noise an ideal transistor will have, but in practice transistors are not ideal and we have to do with another important parameter, which is base resistor Rbb. Rbb represents the resistance of the transistor base, and as it is a resistor it produces thermal noise according to formula 1, and this is added to the shot noise of the b-e junction. It is Rbb which makes the difference in noise voltage between different transistors, because the shot noise (formula 3) is the same for all transistors at equal collector current. So, the Rbb is an important noise parameter, but almost no transistor datasheet does mention the Rbb value. But we can determine it ourselves. Figure 1, the test amplifier for the noise measurement. The thermal noise of the amplifier is almost entirely determined by the resistance of the components near the red line, these are. - The resistance of the signal source, in this case 0.01 Ω. - The series resistance of capacitor C1, which I measured at 0.5 Ω. - Resistor R1 of 1Ω. - That is already a total of 1.52 Ω for the circuit, but we must also add Rbb of transistor T1 whose value is not known yet. 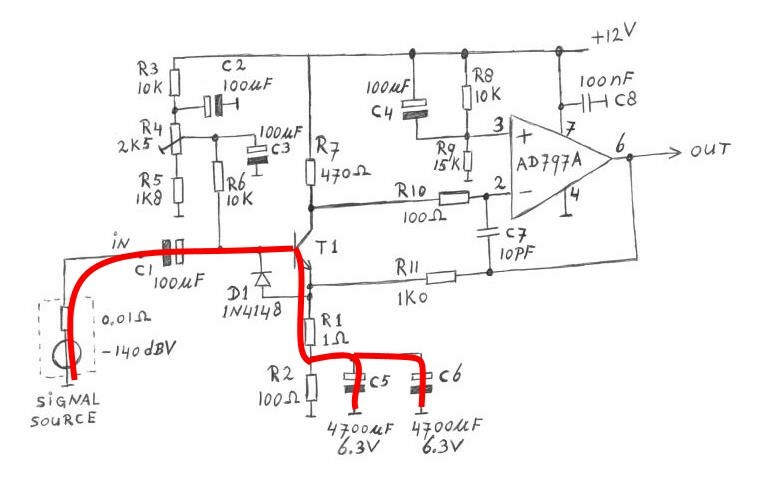 Let's determine the Rbb of a ZTX851 transistor. In the test amplifier we measured en = 0.274 nV/√Hz at 10 mA collector current, and a temperature of 300 K (27 °C). With formula 3 we find for the transistor shot noise voltage esh a value of : 0.14637 nV/√Hz. Now calculate the thermal noise of all the resistors: eth(R_total) = √(0.274² - 0.14637²) = 0.2316 nV/√Hz thermal noise, or 2.316. 10-10 V/√Hz. With the formula: R_total = eth(R_total)²/4.k.T we calculate R_total to be 3.24 Ohm. Then subtract the resistance in the circuit, this was 1.52 Ω, and we have the Rbb of the ZTX851 at 1.72 Ω. We can calculate the thermal noise density in Rbb: eth_Rbb = √(4. k.T.Rbb) in V/√Hz. And then the noise density (both shot and thermal noise) of the transistor base-emitter junction alone, so exclusive the noise in the rest of the components. en(transistor) = √(esh² + eth_Rbb²). But to make it easier, I made the following calculator, which calculates it all for you. 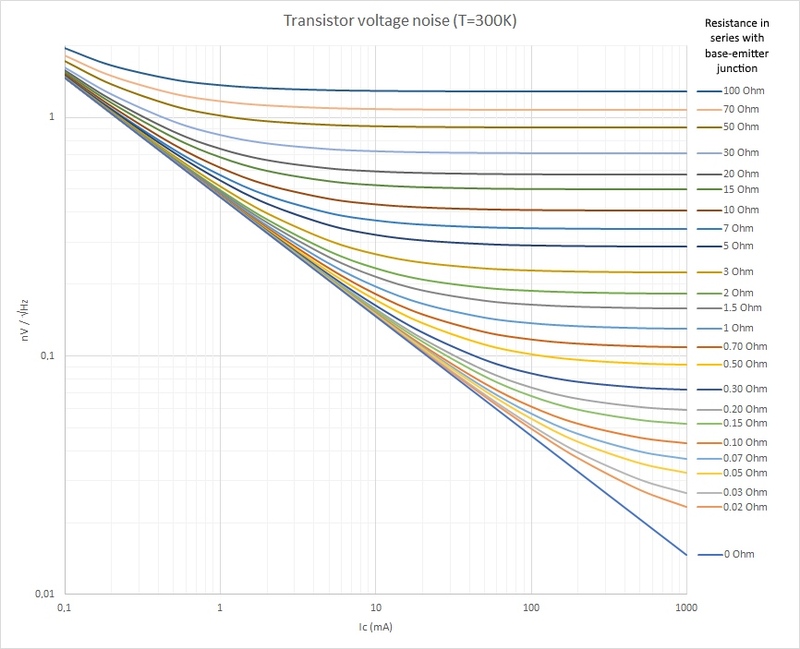 Use this calculator, for determining the transistor Rbb value, and the transistor noise. You can change the values in the yellow fields, and then click the calculate button. Figure 2, this diagram shows the relation between transistor collector current, resistance (sum of R_circuit and Rbb), and the input voltage noise of the amplifier. The 0 Ω line shows the shot noise of the transistor, for the other lines the thermal noise of the resistors is added. With this calculator, you can calculate the noise of a transistor amplifier. This calculator is intended for single ended transistor amplifiers (like the common emitter amplifier), and not for differential amplifiers (like in op-amp input stages). Differential amplifiers have two base-emitter junctions in series in the signal path, and therefore have 3 dB more voltage noise then the single ended transistor amplifier.